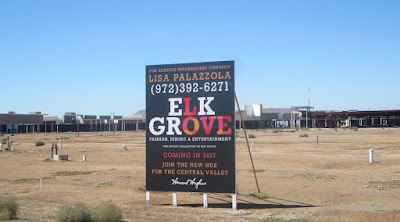 During testimony at tonight's Elk Grove City Council meeting, an attorney representing the Howard Hughes Corporation (ticker symbol HHC) said their unfinished shopping center known as the Outlet Collection at Elk Grove is "on track" to open for shoppers by October 2017. Those comments, made by Kevin Kemper of the Los Angeles-based firm of Gordon Kemper, were said during a hearing on the City's removal of a development agreement at HHC's Outlet Collection in Elk Grove. HHC is in negotiation with the Wilton Rancheria and Las Vegas based-Boyd Gaming (ticker symbol BYD) to sell a 35-acre portion that is part of the 100-plus acre parcel that houses the so-called ghost mall to build a $400-million Indian casino-resort. Following his presentation seeking to strip the development agreement from the 35-acres the Rancheria is seeking, which the council approved by the City Council by a 4-0 vote, Kemper was questioned by Elk Grove City Councilman Steve Detrick. In his questions, Detrick asked Kemper where HHC was regarding reaching sufficient lease commitments to start construction. "We are getting close to receiving sufficient tenant commitments to go forward with the construction of the outlet center," Kemper said. "This is a big deal." In past comments to the Elk Grove City Council Kemper and other representatives have said that HHC would start construction once they had half of the outlet center's 600,000 sq. ft. under lease. Kemper said stripping the development agreement from the parcel's entitlements for the proposed casino-resort will provide the needed synergy to kick start leasing of the Outlet Collection. "I can tell you that a lot of tenants are looking at this quite closely," Kemper said. "We are hoping we can get this going quickly." Questioning Kemper, Detrick said it was his understanding that HHC had a planned opening date of October 2017. Additionally, he noted that he was told that there was a minimum 10-month work schedule from restarting construction until opening of the center, therefore work would need to resume no later than early 2017. "You are getting close to needing to break ground and be active out there by the end of the year or first of January," Detrick said. "Is that on track or is that still up in the air?" "I believe that is on track, this is an important step in that process for us," Kemper concluded. The shopping center, formerly known as the Elk Grove Promenade, has had a checkered history. After years of litigation, construction started in 2007 by mall developer General Growth Company only to come to an abrupt halt in July 2008 during the credit collapse and Great Recession.